What connects Mary McAleese, Seamus Heaney and Derry Girls creator Lisa McGee? They’re all Queen’s University Belfast alumni! Will you be the next to join this illustrious group of great Irish creators, thinkers and world leaders? 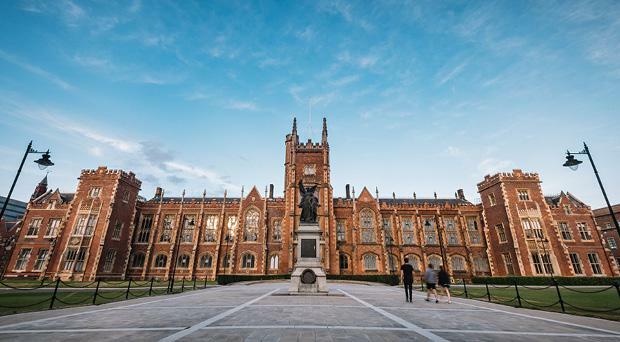 Come along to the event that Queen’s University Belfast is hosting for prospective postgraduate students in Dublin on Tuesday, February 26, to find out why you should apply for one of their academic degrees. An Audience with Queen’s University will take place at No.6 Kildare Street in Dublin, home to the Royal College of Physicians. It will offer prospective students an insight into the university’s courses and global research impact, while also giving them an opportunity to engage with current students and academics. Founded in 1845, Queen’s is one of the top third-level institutions in Ireland and the UK, and a top 200 university worldwide*. A Russell Charter Group University, it is ranked eighth in the UK for research intensity. The university boasts Nobel Peace Prize winners, world leaders and renowned thinkers amongst its alumni. Former President of Ireland, Mary McAleese, graduated from the university with a degree in law and Queen’s graduate John Stewart Bell (the originator of Bell’s theorem) is spoken about in the same breath as fellow physicists Isaac Newton and Albert Einstein. Its Nobel Peace Prize-winning graduates include poet Seamus Heaney (Literature) and politician David Trimble (Peace). Queen’s University is the first choice for many students across the island of Ireland due to their cutting-edge research facilities, vibrant postgraduate community, collaborative approach to learning and global reputation for thought leadership. “Queen’s holds a very special place in my heart and I cherish the time I spent as a student there,” enthused Queen’s Graduate of the Year and Derry Girls creator, Lisa McGee. “It’s where I wrote my earliest plays and where I made some lifelong friends. In fact, several members of our cast and crew on Derry Girls were old Queen’s classmates of mine. It runs postgraduate courses across three major faculty groupings: arts, humanities and social sciences (AHSS), engineering and physical sciences (EPS), and medicine, health and life sciences (MHLS). So students can study subjects ranging from accounting to anthropology, film to food safety, cancer to cyber security, medicine, music, pharmacy, philosophy and more. Attendees at the Dublin event will find out how the university’s four Global Research Institutes are helping to tackle some of the biggest challenges of our time – global peace, security and justice, cybersecurity, health sciences and food safety. A number of world-renowned academics will be speaking at the event, which will be hosted by journalist and broadcaster Audrey Carville. A wide number of topics will be up for discussion, including Queen’s University’s response to the challenges brought about by Brexit and what it could potentially mean for students. Professor Margaret Topping, Dean of The Graduate School, will explain how she runs the intellectual and social hub that connects students to each other, and the relationships that can be formed and cultivated over a lifetime – both inside and outside the university. The panel will include Professor Wei Sha, Postgraduate Dean in EPS, Professor Jannette Elwood, Dean of Graduate Studies in AHSS, and Professor Mark Lawler, Dean of Education in MHLS. Those leading the Dublin event will show how prospective students can become part of a vibrant and inclusive postgraduate community when they begin life at Queen’s. In particular, its Graduate School takes huge pride in how students go on to thrive both personally and professionally. The Graduate School also offers postgraduate students the chance to earn a Level 7 Certificate in Strategic Management and Leadership, accredited by the Chartered Management Institute (CMI). For the academic year 2019/20, there will be three fully-funded CMI studentships available for students applying from the Republic of Ireland, worth £1,000 each. A number of current Queen’s students will also be on hand at the Dublin event to talk about Belfast life and what it’s actually like to live and study in the city. There will also be information around how to find funding for courses and details of loan schemes including the postgraduate tuition fee loan of up to £5,500**, which could help smooth the path for students who would benefit from financial assistance. Queen’s has invested heavily in their facilities and it is one of Europe’s most prestigious educational hubs. In the last decade alone, £350m has been spent developing key facilities, with the promise of another £350m to be spent over the course of the next 10 years. The university is focused on helping students find employment their chosen field so maximising every student’s employability is at the core of everything it does. It strives to ensure that students leave with the skills to allow them to work anywhere in the world. There is ongoing support to develop each student’s entrepreneurial and employability skills, and 94pc of Queen’s postgraduates are either in employment or further study within six months of leaving Belfast. Anyone interested in attending the event on February 26 is urged to register their interest now to avoid missing out. To book a place at Dublin event and take the next step to postgraduate study at Queen’s University Belfast, register now on the website.